Running multiple instance of MediaWiki on the Same Server using the Same Source Code? 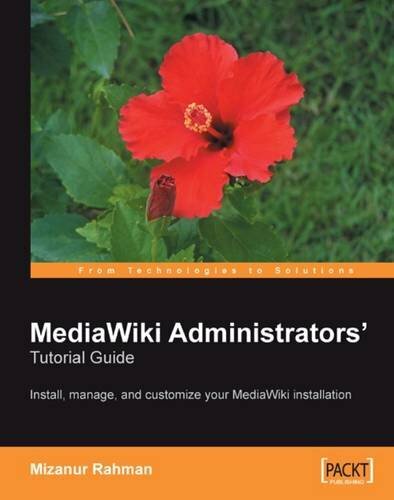 Note: The content is written for the “MediaWiki Administrators’ tutorial guide” book readers. So you will find some reference of the book here. Ignore those references if you do not have the book. You can download the PDF at the bottom of the article. Sometime it might require for you to setup multiple MediaWiki site on the same server using the same source code. The reason behind using the same code base for multiple wiki is easy to maintain the changes. It is always easier to maintain a single thing rather than instances of the same thing. In order to accomplish this task you have to follow few simple methods. 3. 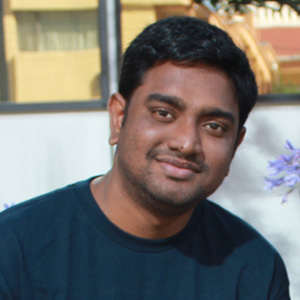 Use different database server. 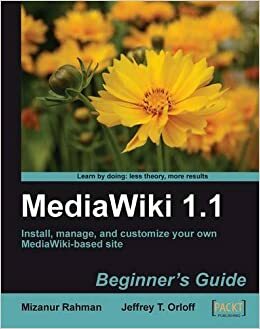 In chapter two of the book you have learned how to install MediaWiki at your server. You also learned the fact that you have to move the LocalSettings.php file in the root folder for the installation to work. Now here are steps to apply. 1. Rename your existing LocalSettings.php file to Wiki_one_settings.php or anything you want to. 2. Now open a browser window and type your URL location for the wiki. If your URL is http://www.mywiki.com then try to browse the http://www.mywiki.com/config/ . 3. You will be taken to the installation page same as described in chapter 2. 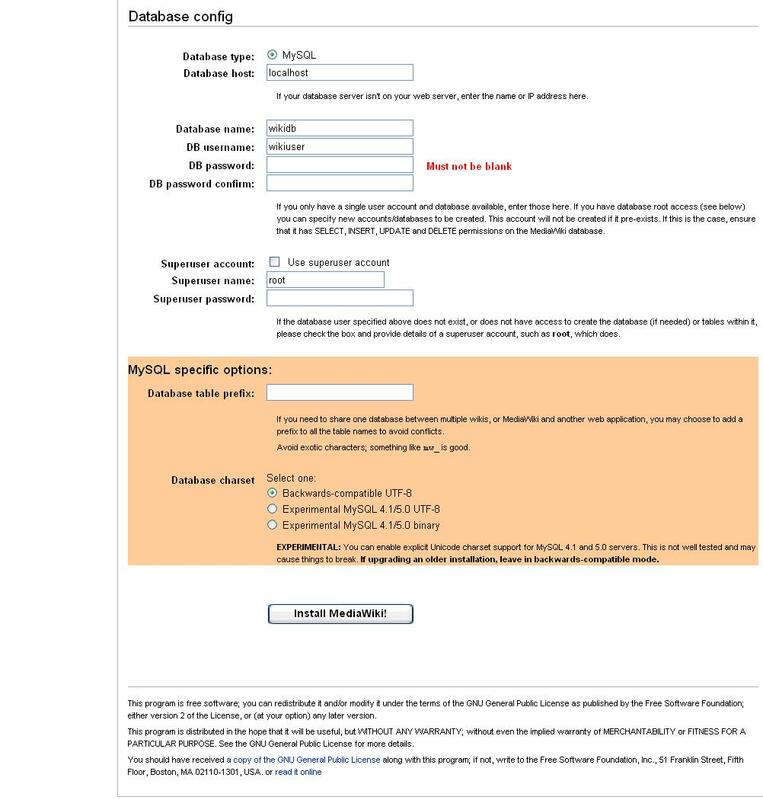 You have to follow the same steps until the database configuration section. As you know you can choose the same database but different prefix for new installation or you can choose a new database name for the new installation or even choose a new server located in some other place for the new installation. Here is the place you have to enter the database information. 4. If you want to use the same database but different tables then we gave to add database table prefix in the colored region of the image. You can add any prefix for the new tables. If you wan to add new database then add database name in the database name field. 5. After putting all required information, click the install button to install new instance of MediaWiki. A new instance of the MediaWiki database has been added to the database server according to your chosen method and a new LocalSettings.php file is also created in the Config folder. Like you did in chapter two, you have to place this file in the root folder. But you have to play another little trick here. Since it is used for second wiki, we have to rename the file as Wiki_two_settings.php (or any name that you want to) and then you can place it in the root folder. For the first scenario we have to write the following code and save it as LocalSettings.php. Now you run the wiki and see the different wiki using the same source code. If your site address is www.mywiki.com then browse www.mywiki.com/wikione/ and also www.mywiki.com/wikitwo/ . You will find the difference by yourself. Note: To link the sub domains to the server, you might need to edit the configuration file of the server or change the DNS configuration of the site. If you want to set different upload directory for each wiki installation, you can do that too. Just define the upload directory on each of the LocalSettings.php file for each wiki. First you have to make sure that the file upload option is enabled. Then add the following line at the end of the LocalSettings.php file. Now save the file and access the pages. We are all done with setting different image directory for each wiki. Sometime it might be required for you to share files and extensions for your wiki installation. For creating a shared directory we have to write the following lines from DefaultSettings.php to LocalSettings.php file for each LocalSettings.php file. In order to share common extensions first you need to copy all the extensions inclusion to a common file. You can name the file anything you want to. Now include the common extension file in every LocalSettings.php file you have created. So if you need to add/remove any extension you just have to edit the common extension file not every settings file. This way you can integrate multiple wiki using the same code base. You can play around with the LocalSettings.php file as you can put some kind of switching command instead of creating separate setting files. The way is shown and you can apply your knowledge for something better. Note: if you are looking for more references then you can look at the following sites. They are very well explained.